Gamex is Western Australia’s premiere game fishing competition. Teams can fish the abundant waters off Exmouth in small or large vessels to target over 40 different species of game fish, including six different species of billfish. 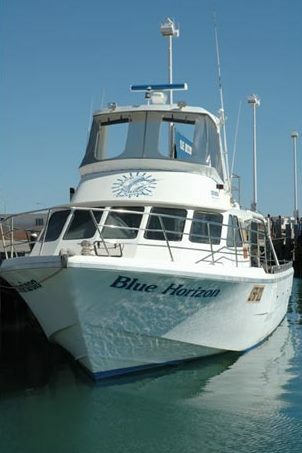 Why not Charter the Blue Horizon to compete in the annual competition where people come from all sides of the world. Includes 6 days game fishing, all gear, meals and water supplied. BYO alcohol. Enjoy a day on the pristine water game fishing on the Blue Horizon, a luxury vessel equipped with the latest electronic equipment, 240 V power and air-conditioned. Gamex 1998 – Champion boat tag and release Marlin. Gamex 1995 – Champion boat tag and release Marlin.